Asian women are spoken of as beautiful beings all over the world. And the Asian look is something people definitely work hard to get. The beautiful hair, lovely skin and the almost perfect body structure is something everyone craves for. But it is the Asian eyes that get a special note from everyone. Asian eyes have a unique shape and are quite beautiful. So let’s talk about how to put on eye makeup for Asian eyes that you can also easily do! To your lid without proper base of a makeup, no matter where you’re putting it , your makeup won’t last for a long time. So to avoid greasy eye base put a little primer on to the lids and blend well. Conceal fine lines or even dark circles around the eyes with 3 dots starting with the start point of the eye. 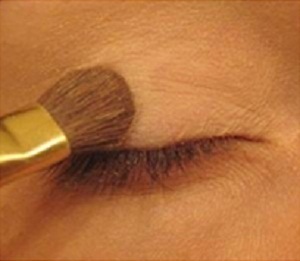 Put the 2nd dot of concealer at the center of the lid and the 3rd at the end point of the eye. Blend with the ring finger; do not rub in a circular motion. Similarly put foundation in 3 dots in the under eye region and blend in. Use a dark liner like black or even dark brown or dark blue. The lower rim can be given a milky white lining. The selection of three tones of eyeshadows can give a party perfect Asian eye makeup look. Start applying with a similar to the skin color shade. Follow it up with a bronze swiping across the lids that extends in a tail. Then apply a little darker shade say brown on to the lid only. Next a crease effect on to the crease (not the whole lid) with a darker shade like dark brown or dark blue or even black or charcoal. Blend them up to play with colors. With a highlighter. Brighten up your brow bones with a shimmer shade and also put a small dot of shimmer silver (I use elle18 eye sparklers silver as a highlighter) at the start of the eyes and nose end point. This dot increases the separation between nose and eyes so that eyes look more bright and beautiful. Asian eyes shine with a little dash of dark eyebrows. So fill in your empty points of your brows with an eye brow pencil and give it a good shape after plucking or whichever method you may follow. Double curling is done to get added curl and also to highlight the eyes and make them look big since asian eyes are smaller. So curl before applying mascara. In a back and forth zig zag movement for the upper lashes and for the lower ones just give a sweet swipe or two. Again curl after applying mascara (not immediately). Rub them clean with rubber or silicon pads for next use.